Discover Aduna Baobab. The 100% organic superfruit that dries naturally on the branch. It is an excellent source of vitamin C and nearly 50% fibre. There is no such thing as a baobab plantation; every tree is family-owned and wild-harvested. Aduna partners with rural African communities to ensure that each purchase makes a direct contribution. No wonder they call it The Feel Good Fruit! It is suggested that you take a daily dose of 2-4 teaspoons. 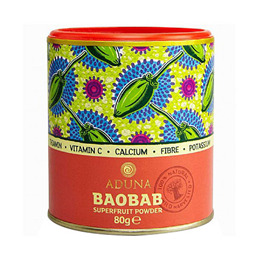 Aduna Baobab has a unique, citrusy flavour that’s a tasty addition to your favourite shake and smoothie recipes, sprinkled onto porridge or cereal or stirred into natural yoghurt. As baobab is so fibre-rich, when mixing with a liquid, first mix into a paste using a small amount of liquid before topping up your glass. Suitable for pregnant women and kids. Below are reviews of Aduna Baobab Superfruit Powder - 80g by bodykind customers. If you have tried this product we'd love to hear what you think so please leave a review. I like the fact that it is fibrous, as when I have this my bowels are clear, as I am very 'regular'! It has a tart taste which is ok, I normally have it with luke warm water.